Pro-union home health care workers and clients celebrated the results of their organizing election last August. 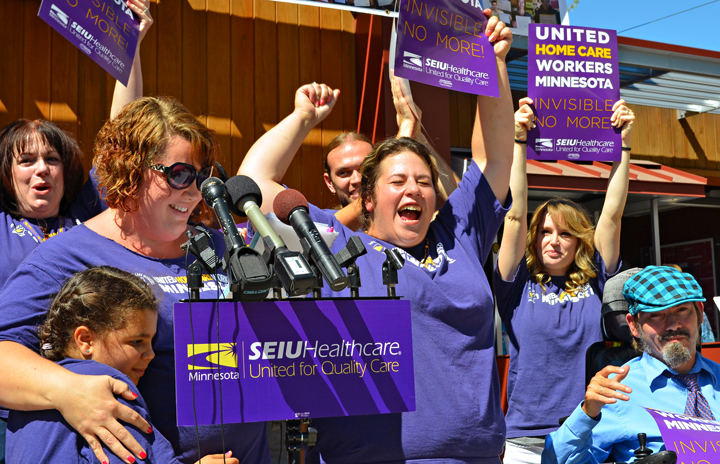 Five months after their historic vote to form a union, home health care workers represented by SEIU Healthcare Minnesota today announced they have reached a tentative agreement on a first contract with the State of Minnesota. The agreement includes several gains for the new bargaining unit of 27,000 workers in publicly funded home care programs statewide. The contract would raise the wage floor to $11 per hour, fund training opportunities, protect workers against lost wages and provide full-time workers with five days of paid time off annually. Members of the union will take a ratification vote on the tentative agreement in the coming weeks. If members vote to accept it, the agreement will come before the Legislature for final approval. Home care workers took an innovative approach to negotiating what could become the first new union contract with the state in decades. The union’s bargaining team for negotiations included not only SEIU Healthcare Minnesota members, but clients who receive home care services as well. Home care recipients were at the forefront efforts during the 2013 legislative session to extend collective bargaining rights to home care workers. Recipients like Maplewood resident Nikki Villavicencio, who joined the union’s bargaining team, argued that better wages and working conditions for caregivers means increased stability and higher-quality care for clients. “This is an important step in our fight, so that both workers and care recipients like my family can finally live the lives we choose,” Villavicencio said in a press release issued by SEIU Healthcare Minnesota to announce the tentative agreement. Funding for wage and benefit advancements in the tentative agreement, the union said, will be included in Gov. Mark Dayton’s budget proposal to the Legislature, expected in the coming weeks. Home care workers’ union has voluntary membership, meaning there are no “fair share” dues assessments. Voting on the tentative agreement will be open to home care workers who are SEIU Healthcare Minnesota members.